Just watched "Toy Story 3," which was awesome, and which showcases many of our favorite childhood toys. One of the ones I remembered the most after the movie ended was the brave little Chatter Phone, also known as the Talk Back Telephone. It's simple but awesome. Colorful, fun to play with (the eyes roll back! it makes sounds!) It was supposed to teach kids how to dial a phone -- a no-longer-needed art in this day of push buttons and touch screens. 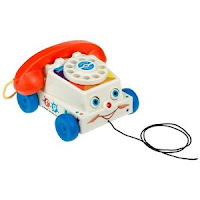 I was at Target not that long ago and the phone was one of several Fisher-Price toys now repackaged in vintagey boxes to appeal to us Gen Xers who are now parents or uncles and aunts to modern kids. If Kelly was a little younger, I might have been tempted to pick one up. We had one in our Spanish class in high school and our teacher (RIP, Sister Judith) had my friend Kate and I use it to do a Spanish dialogue in front of the class. Faced with that goofy phone we just could NOT keep a straight face. I'm sure that didn't help our grade. Do you have fond Chatter Phone memories? Do modern kids even know how to dial a phone?